This special occasion short set navy and blue and white striped cotton seersucker adds a touch of class to your outdoor events. It is perfect for warm day and balmy evening events and also quite popular for cruising as it has a touch of that nautical feel. 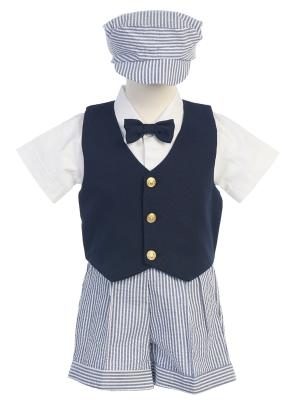 This 5-piece set includes a navy vest and bow tie, dark blue and white striped seersucker shorts and hat, and a white short-sleeve dress shirt. The set is machine washable. The shorts and hat are 100% cotton, the vest is polyester and fully lined and the shirt is a poly-cotton blend. This set is made in the USA by Lito. 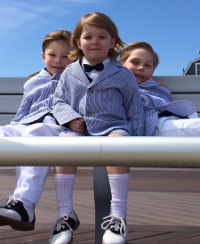 See also the coordinating outfits and dresses for siblings.